What kind of repairs need building or structure, depending on the duration and conditions of its operation, the capital building, the condition of individual elements: foundations, bearing structures, roof, utilities, etc. In terms of examinations is determined by the type of repair. Reconstruction, capital or current. Can also be carried out cosmetic repairs. A separate category of repairs and renovation of the elite. Any kind of repair is carried out with the aim to extend the service life of a building or structure. If the examination of the building showed the need for major repairs, the estimate on all work. It should be noted that clear boundaries between categories of repairs is difficult to determine. Overhaul involves the partial or complete reconstruction of the building (construction), reconstruction of parts of the building, replacement of communications and carrying out finishing works. In the survey before conducting a major overhaul may be the conclusion that the building or structure cannot be repaired and must be demolished. What can be included in the overhaul? It all starts with the survey and cost estimates. Work on the fencing of dangerous areas around the building. Equipment outbuildings. After that, proceed to the replacement of sewage and water, heating system. Replacement of electrical wiring and ventilation systems. There might be an increase in the level of utilities and of equipment taking into account modern trends. Is the repair of the Foundation, wall, roof or building a new roof. Repair flights of stairs. If necessary, run redevelopment. Can be plug-ins, extensions, or to perform a partial dismantling of previously constructed extensions. Then proceed to the repair of facades and architectural improvements. Replacement of window and door openings. And last of all performed internal finishing works: leveling of floors, ceilings and walls. Often in the course of capital repairs and reconstruction carried out landscaping of the adjacent territory. 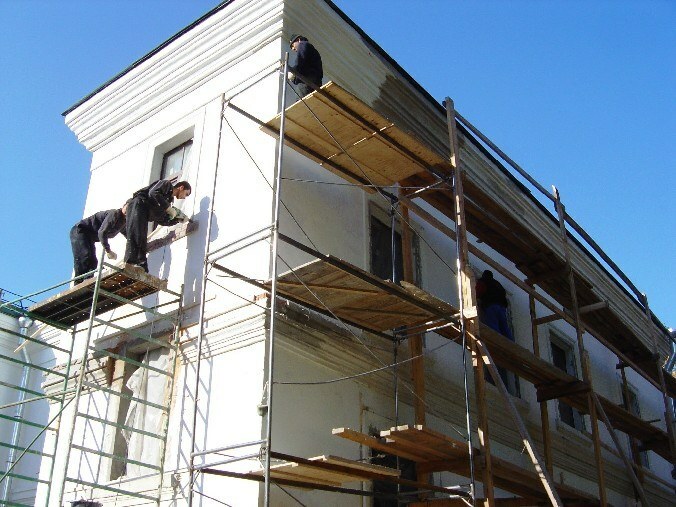 The repair is performed to restore the operational performance of buildings and structures to extend the possibility of their exploitation after the reconstruction. Current repair is conducted if the building was worn out, but it is possible to maintain its performance data. The basis for the current repair will be a survey or a period of planned repair. Thus the estimated elements of the construction and condition of utilities. Scheduled maintenance for buildings and constructions is carried out in the estimated, planned, certain regulations, timelines for the extension of technical lifetime. It is connected to the capital or current repair. Scheduled maintenance can be both capital and current. It depends on the lifetime of the building and frequency of repairs. - Sealing of joints of walls, repair of facades and balconies. - Repair of the roof and drainage elements. - Repair of foundations, partial restoration of their plaster, pavement. - Repair or replacement of piping and utility systems, including heating, water and Sewerage, electricity and ventilation. - Partial replacement or repair of Windows and doors. - Repair of floors, replacement of coatings. - The internal finish is plaster walls and ceilings, putty, tiling or other materials wallpapering. Carry out the necessary painting work. If the building or structure is in need of minor improvements related to appearance or interior space, you can carry out minor repairs. This kind of repair involves a slight amount of work on the painting of walls or floors, window frames and doors, papering. The essence of cosmetic repair to improve the appearance of the building, freshen up the exterior or interior finishes. In recent years, a sharp increase in proposals for new construction and finishing materials, new technologies in construction has led to the emergence of a new kind of repairs, so-called renovation. Main difference from the current or capital repairs is the use of modern building materials and technologies during its implementation, another difference of the renovation is to transition to European standards. The renovation includes a compulsory development of the design project preparation of the project in case of alterations and obtaining permits. Purchase high quality materials and modern equipment. This is followed by a renovation in the agreed amount and a strictly defined sequence. Elite repair requires in addition to the use of the latest materials and equipment highest level of qualification all professionals from designer to decorator and considerable experience in the organization of such works from the contractor.